SPOIL YOUR BALLOT BATTLE BUS! 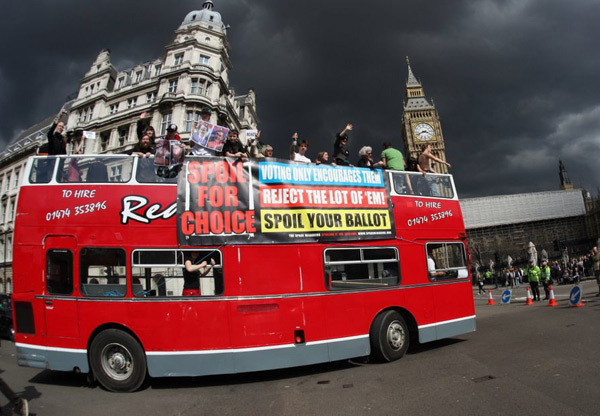 This Mayday on the Space Hijackers took our anti-election battle bus to the streets of London and the home of government. We've all seen George Galloway and the other cronies charging around in open top buses trying to persuade people to vote for them, but we all know the whole thing is a scam. 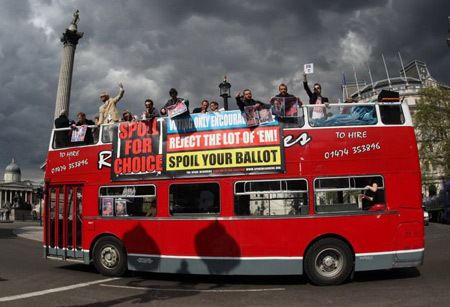 So we hired our own open top bus, and flew around London giving out an alternate message - SPOIL YOUR BALLOT, REJECT THE LOT OF EM! The Space Hijackers, Spoiling it for everyone! In our 'democratic' system we're given the choice to vote once every four years, to place our bets on a team for the next 48 months. To chose between red and blue (perhaps even a little yellow). But let's not be fooled by the colour of their ties, we know they're all the same. Whoever you vote for, the government always gets in. Where’s our ‘none of the above’ option? If voting actually changed anything they would ban it. Did you get to vote on the Iraq war? Did you get to vote about regulations on banking? Did you get to vote on MP's expenses? Is this a democracy or a bad joke? Why play by the rules in this farce of an election? Every spoilt ballot gets counted and shown to the candidates in that constituency, so why not reject the lot of them and tell them what you think with your ballot paper? Does your vote really count? With our first past the post system, unless you vote for the winning horse in your area, your vote is simply discarded with the rubbish. In 'safe' seats your vote is practically worthless. In Hackney South, for example, your vote is worth 0.039 of a real one and that's certainly not the worst example in London. Find out who's standing in your community. Do any of the candidates actually care about the issues you do? If not, why vote for any of them? Don't go for the best of a bad bunch. Don't just sit there whining! This is about active rejection, not passive reflection. Get yourself to the voting booth and get spoiling. In a bogus system, it's the only authentic choice. 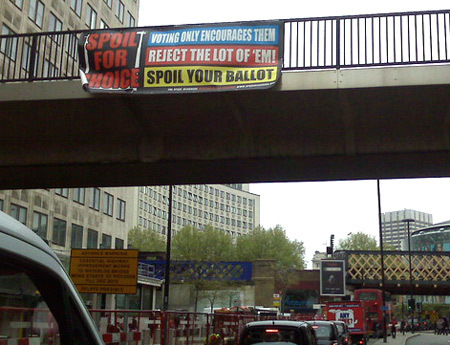 Spoiling your ballot is not illegal, spoiling you ballot is your only chance to have your real say in this election. Party Politics is a self protecting machine. Even by spoiling your ballot and rejecting them all, they will not just go away. Take your politics to your community, get organised, get talking, get active. Why should we only be given a voice once every four years? Get vocal and give 'em hell. The government get scared stiff when the population get self-organised.